The Osun State Police Command on Wednesday paraded five robbers operating with military uniform along Osogbo/Ilesha Road. The robbers while being paraded before journalists at the police headquarters include; John Daniel, Emmanuel Irem, Stephen James, Monday John, Abayomi Samson and Samuel Egbe, and all confessed to the crime committed. The state Commissioner of Police, Mr. Fimihan Adeoye, told journalists that the suspects actually reside in Lagos but use Osun as their operating center. He added that, the suspected robbers do come to Osun to carry out the devilish activity. 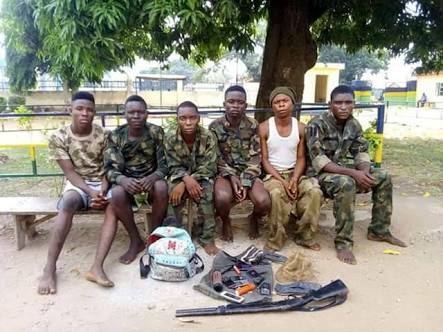 According to him, the four robbers fully dressed in soldiers uniform were arrested during the operation, through a joint effort of men of the command from Ile Ife, and members of the Vigilante Group of Nigeria. In a chat with journalists, the leader of the gang, Stephen James, said he got military uniforms from an abandoned building in a military cantonment in Lagos. James confessed that he recruited other members of the gang from a slum in Ijora, Lagos, adding that they started robbing passengers on Osogbo/Ilesha Road around August last year using fake rifles in carrying out their operations. In another development, one Yekini Ayinde also known as Abija who was the leader of a gang responsible for the killing of a rice dealer, Sanusi Isiaka, in Osogbo on May 14, 2007, was also paraded. “Yekini then contracted others and took the Isiaka to a secluded place along Osogbo/Iwo Road where he was killed. One of those that Yekini contracted also beheaded the deceased and use his head for money rituals. We have apprehended two of those people that assisted Abija to perpetrate the crime"